← Hello GoodBye info: 28.04.18 – ft. Wendy Rae Fowler, Johanna Bramli + Sephine Llo. This Saturday 28th April 2018 Wendy Rae Fowler, Johanna Bramli and Sephine Llo all performed live in session on Resonance FM’s Hello GoodBye Show. Alabaster dePlume – Did You Ever Hear About The Mau Mau? 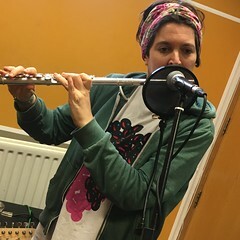 This entry was posted in dexter bentley, hello goodbye show, Hello GoodBye: Playlists, resonance fm and tagged dexter bentley, hello goodbye, hello goodbye show, johanna bramli, london, radio, resonance fm, sephine llo, wendy rae fowler. Bookmark the permalink.